So this year one of the things I've decided I'm going to change is my weight. I have been overweight since I was 16 years old. I was besotted with a boyfriend 6 years older than me, was studying for exams and decided I was too old for Highland Dancing so after years of dedication to this hobby I gave it up overnight. I had classes 4 days per week with competitions at the weekend, not surprisingly as my activity levels went from hero to zero and the number on the scales just kept rising. It went on very fast and I've struggled with my weight ever since. Fact #3 I have wanted to lose weight, even longed for it since it piled on 13years ago! So why is now different? In answer to that - I don't know, but I do hope this motivation lasts. I have decided to put everything I know into practice - energy requirements, medical knowledge, nutritional contents, behaviour change skills, psychology and good old common sense. So I've also started a group! Yeah I can't do anything in half measures. 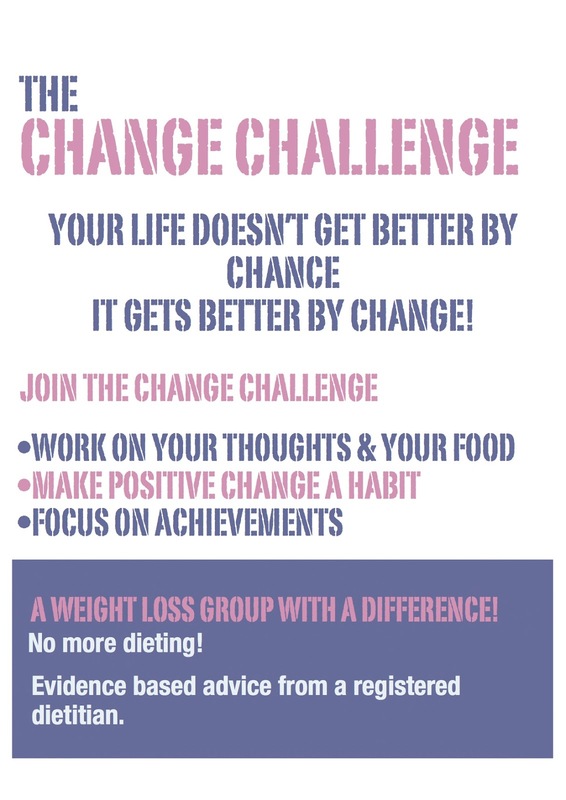 So I am running a group on a Monday evening called the Change Challenge. Each week I load the group up with information and set them a challenge to put healthy eating principles into practice. So this week was about enjoying your food more. This challenge asked us to slow down, relax and enjoy our food with all our senses. Commit to eating one meal each day as if it's your favourite food in the world and your describing it to someone who's never experience this dish before. It's about eliminating distraction, being mindful and falling in love with food again instead of it being the enemy. The other challenge this week had the title "Dance like nobody's watching!" and I have to say I'm enjoying it even more than I thought I would. So maybe I'll try do a blog on one of my favourite songs for this week. Any sensible slimming tips please feel free to add them below! 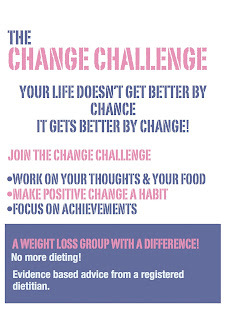 This is not about fad diets but more on self acceptance and adopting a healthier lifestyle.